As I planted seeds for my vegetable garden last night, it occurred to me that we need to sow seeds in many areas of our lives. To reap the fruits for sales, relationships, and long-term success we need to continually plant seeds…and then take care of them. How does this relate to business and to sales? How do you sow seeds for future sales? Nurture your seeds. Stay in contact with your prospects. 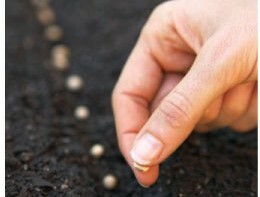 Seeds need watering and sunlight—feed your contacts with value added information and attention. Sow referrals. Current customers and your network of possible referrers need attention as well. Help them help you by clarifying the type of prospects you seek. After they provide a referral, keep them updated on your efforts so they know you are not wasting their time and relationships. Of course, refer back whenever possible. Ask. To make sure you aren’t nurturing rotten seeds that will never bear fruit. Ask the tough questions after you have engaged the contact. Ask them about timing, the risks for doing nothing, the rewards for making a decision and implementing your solution. Ask for decisions and commitments, connections to other people. Just like different plants, your prospect seeds will be harvestable at different times. What’s important is that you are professionally persistent in your care of them. I nurtured a prospect for 5 years, intermittently thinking it was going nowhere and a waste of time. But I always ended each conversation (even if it was 2 minutes) asking for permission to contact him again. It paid off when they were finally in a position to bring in world class training to their sales team. We were given the opportunity to propose our solution and won the business with over a $350,000 sale the first year! Now, that was a seed worth sowing. Your turn! What have you found to be effective in sowing and nurturing your future sales seeds? Leave a comment for a chance to win a signed copy of the Conversations That Sell book.